Since the dawn of the Republic (well maybe not that far back) letter grades have been the standard in most public and private schools in the United States. Generations of students grew up with the A-E (or A-D and an F) grading system to help them determine how well they were doing in school. It was a simple, comprehensible but exacting way for parents, teachers and school administrators to track a student’s academic progress (or lack thereof); to determine their strengths and areas in need of improvement. Sadly, school districts across the nation have been dumping its standard letter grading system for its elementary and/or middle schools like a first wife whose husband traded her in for a newer model due to a midlife crisis. 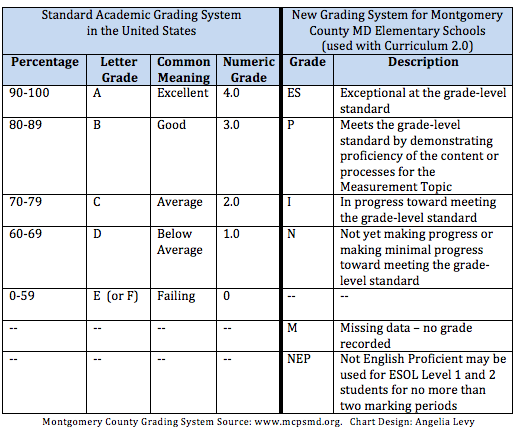 In the case for Maryland’s Montgomery County Public Schools (MCPS), in 2013 its elementary school grading system was replaced with the convoluted ES-P-I-N-M-NEP version (see chart). The new grading system is part of the implementation of Montgomery County’s Curriculum 2.0 – based on the Common Core education standards. (Note: MCPS began rolling out the new curriculum on a grade-by-grade basis in 2009-2010 with some kindergarten classrooms at participating Curriculum 2.0 pilot schools). At the start of the 2014-2015 school year, grades K-6 will use Curriculum 2.0 and grades 7-12 will continue with its previous MCPS standard curriculum (AKA ‘Curriculum 1.0′ ). Therefore, by Fall 2020 Curriculum 2.0 will be used by grades K-12 in Montgomery County. MCPS’ adoption of its version of the Common Core curriculum hasn’t phased most Montgomery County parents. It’s the new K-5 grading system – designed by MCPS – to work with the new curriculum to better measure elementary students’ knowledge and academic aptitude that has parents flummoxed. Luckily for us (and other 5th grade students and their families at our former elementary school) we only had to deal with this hair-brained grading system for one year (2013-2014) since MCPS will still use the A-E grading system for its 6-12th grade students. But there will be many current elementary school parents and families with incoming kindergarten students who will be tortured for several years trying to figure out MCPS’ elementary school grading system, that is, if they ever do. In June 2013, our son’s elementary school administration gave its rising 5th grade parents an overview of Curriculum 2.0 and the new grading system. The parents didn’t have questions about the grading system, but some were up in arms over the elimination of ‘gifted/accelerated’ classrooms (not surprising since helicopter parents have been jockeying for better placement for their kids since they were fetuses). My husband and I weren’t pleased with the new curriculum. We definitely weren’t thrilled with the new grading system, but decided to abstain from an opinion until we had an opportunity to see both in practice. When my son started his 5th grade year in Fall 2013, I immediately noticed the lack of grades on returned assignments. As to be expected we weren’t seeing the A-E grades, but we also weren’t consistently seeing the new grades (ES-P-I-N) either. Grades on assignments were numerical in nature, for example “8/10” or “15/20” based on the number of questions the student was asked (e.g., ’10’) and problems that the student solved/answered correctly (e.g., ‘8’). Since the fifth grade teachers were learning and incorporating the new grading system and Curriculum 2.0 simultaneously, I wasn’t surprised by the primary usage of numerical grades. However, when I spoke with parents with children in other grades at our elementary school and at others schools in Montgomery County, I discovered this same numerical grading system/method was being used in their child(ren)’s classrooms as well. Our son knew what the new grades meant (e.g., ES = exceptional, P = proficient, etc. ), but we were pretty sure that he didn’t truly understand how MCPS interpreted the grades. As a result, my husband and I got into the habit of translating his numerical grades into the standard A-E letter grading system and the new grading system so that our son would have a more solid understanding of his academic progress. For many parents, the new grading system primarily existed on their child(ren)’s report cards for them to attempt to decipher, with one Montgomery County parent Chuck Thomas wondering if ‘ES’ stood for “elusive secret.” Was this what MCPS had in mind for its state-of-the-art-allegedly-more-honest-and-accurate new grading system? Yet, if MCPS is so gung-ho about the new grading system and curriculum why haven’t they implemented both for all MCPS students? Why the grade-by-grade roll-out? MCPS knew that implementing a new curriculum and grading system throughout grades K-12 would cause a serious parental riot, especially among high school parents. Could you imagine high school kids trying to explain an ES-P-I-N transcript to potential college recruiters? Middle school parents wouldn’t be too pleased with the change either given their children would be entering the pivotal high school grade years. As a result, MCPS decided it would be easier to take a hit to the face than a kick in the balls (metaphorically speaking), which is why they ended-up only using elementary school students and their parents as guinea pigs for its new curriculum and grading system. Maybe they thought elementary school parents would be more receptive (nee malleable) to its new curriculum and grading system. If things worked out then MCPS would have data to support its curriculum and grade system changes. If it doesn’t do well then they’ve only caused academic and administrative problems for elementary schools and their students respectively. No big deal. Who really is profiting from the new grading system? Maybe Pearson was interested in working with MCPS, but I’m sure the fact that grades K-5 (Curriculum 2.0 users) and 6-12 (non 2.0 users) MCPS students will be tested using PARCC played a significant financial part in Pearson’s desire to saddle-up with MCPS, the 17th largest school system in the United States with over 150,000 students. It will be after 2020 when MCPS will be able to assess whether it’s new curriculum has been a good thing for Montgomery County. Furthermore, the elementary school’s new grading system, which generally has not been well-received, will be lucky to last five years. Whether you’re a proponent or opponent of the Curriculum 2.0 and/or the ES-P-I-N grading system, it’s hard to believe that MCPS truly stands behind either given the piecemeal way both have been installed. Nevertheless it appears MCPS’ Curriculum 2.0 is here to stay and elementary school students, parents, teachers and administrators will continue to be MCPS’ test subjects for the immediate future. On this issue, the Montgomery County Public School System deserves an ‘N’ for execution (that’s a ‘D’ to everyone else). 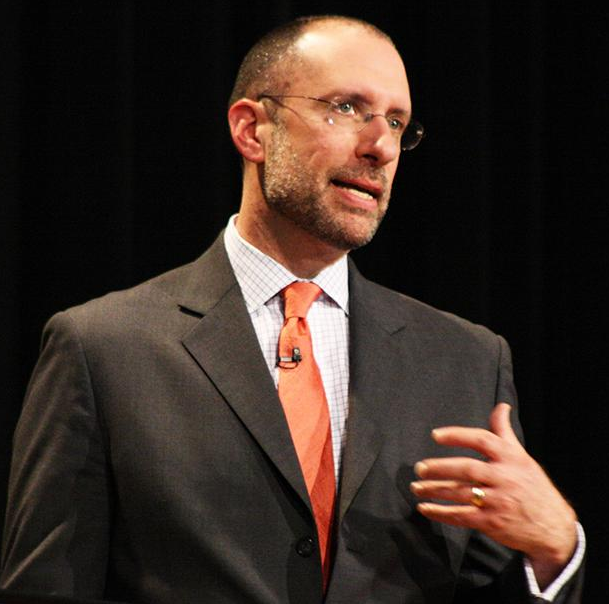 –(February 3, 2015) Montgomery County Public Schools Superintendent Joshua Starr announced his resignation. His resignation was effective February 16, 2015. –(March 8, 2016) Montgomery County Public Schools hires Jack R. Smith as its new superintendent. Smith has a four-year contract with MCPS. –(March/April 2018) Montgomery County Public Schools announces that it is looking to replace Curriculum 2.0, which many educators had found to be “lacking.” Parents had mixed-reactions to the news. –(May 2018) “Potential conflict of interest derails curriculum rollout in Md. school system” MCPS put a ‘hold’ on its search to “overhaul its classroom curriculum” due to its concern about a potential conflict of interest. Two of its soon-to-be retiring employees (one of them being Erick Lang, Associate Superintendent of Curriculum and Instruction programs) have been involved in the ‘new curriculum’ selection search though their future employer is one of the vendors/companies who are under consideration by MCPS. Notes: 1) The ‘If letter grades were good enough for Jesus’ title is a paraphrase of the quote “If English was good enough for Jesus Christ, it ought to be good enough for the children of Texas”, often credited to James Ferguson (governor of Texas) who in 1917, allegedly said those famous words in reference to the issue of bilingualism in Texas schools. 2) I want to thank Donald Earl Collins for providing me with feedback and clarity concerning MCPS’ educational policies.